Ravitz Family Markets is hosting its semi-annual Gluten-Free Festival at ShopRite of Marlton (307 W. Route 70) this Saturday from 10 a.m. to 2 p.m. There will be over 60 different products available for sampling, including items from local businesses like Sweet Megan's Bakery and The Little Bakery of Blue Bell (sweets), Sweet Note Bakery (bagels), Tonya's Gluten-Free Kitchen (soft pretzels), Caesar's Pasta, Bill’s Best BBQ Sauce, Snyder’s of Hanover and Brad’s Raw Foods and national brands such as Chex, Dole Soups, Kikkoman, Udi's, Dannon, Cabot Creamery, Dr. Praeger's, Pamela's, Absolutely Gluten Free and Kinnikinnick. 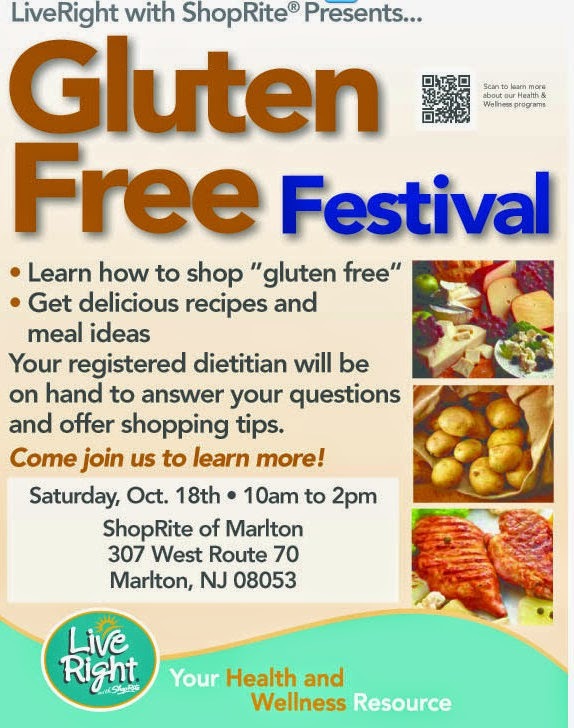 The National Foundation for Celiac Awareness, the Southern New Jersey chapter of the Celiac Support Association, the South Jersey Health & Wellness Center and ShopRite's Registered Dietitian Ashley Cully will also be on hand with gluten-free and wellness information.